US sanctions on Russia and other nations are imposed to wage war by other means. When unilaterally imposed, they’re a hammer in lieu of diplomacy. Washington weaponized them to illegally attack nations politically and economically for failing to bend to its will – a bipartisan conspiracy against rule of law principles and responsible governance, absent in America and other Western societies, democracies in name only. Make no mistake. US political and economic war rages on Russia, Iran and other targeted nations – at risk of turning hot. US Assistant Secretary of State for European and Eurasian Affairs A. Wess Mitchell holds the same portfolio as the infamous Victoria Nuland in the Obama regime – both officials hostile to world peace and cooperative relations with other countries, supporting US dominance by endless aggression and other unlawful means. On Tuesday, Mitchell addressed the Senate Foreign Relations Committee on the Trump regime’s agenda toward Russia. He called “military power…fully integrated with our allies and all of our instruments of power” Washington’s most effective tool in its “diploma(tic)” arsenal. He said “the door to dialogue is open” – provided that Moscow surrenders its sovereignty to America, wanting a repeat of the 1990s under US favorite Boris Yeltsin, a deplorable figure presiding over Russia’s lost decade. He claims that Moscow threatens “the Western world.” He said Russia “promote(s) fringe voices…advocat(ing) violence, the storming of federal buildings, and the overthrow of the US government” – a claim only fools and a brainwashed public could believe. He also said that Russia “foments and funds controversial causes.” They include world peace, stability, equity, justice, multi-world polarity, and mutual cooperation among all nations – notions dark forces running America abhor. 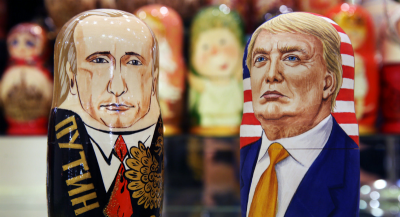 Trump regime hardliners are waging propaganda war on Russia and other countries to influence and control the public mind, escalating political and economic war on Russia and other nations – risking hot war by accident or design. Accusations against the Kremlin are specious. US enemy No. One is targeted for its independence and opposition to US imperial aggression, supporting world peace and stability, along with wanting a marketplace advantage for US corporate predators. Washington is on a slippery slope toward greater aggression than already – risking humanity destroying nuclear war, the ultimate nightmarish scenario.